Image still from Canada JKF Wadokai multimedia website. 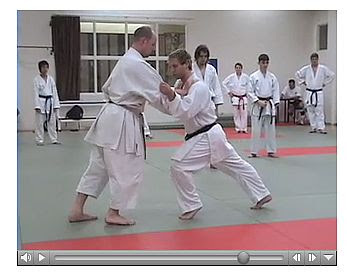 The short The Blitz training video by Eric Hill, produced by Canada JKF Wadokai Karate, has some great kumite skills. Hill Sensei is a professional American kumite coach. A karate blitz is a popular term for a sprint punching combination attack that starts like a sprinter off a starting line, instead of a regular stepping or sliding forward attack. Peter Stoddart, HollyBurn Country Club (Canada) Karate Club Chief Instructor, is the partner in the video. Peter demonstrated these skills to the Seiritsu Karate Club last year when he visited Japan and the students found them very useful to learn. 5. How to develop 'triple extension' by creating explosive power from the ankles to knees to hips. Hill Sensei explains how he learned to lead with the hands and lean into the blitz, not bend into it, from US Olympic sprinters. Here is an article in English about Hill Sensei's kumite seminars.